Maigret and the Hotel Majestic starts superbly, with the awakening of the suspect Prosper Donge and his journey to the hotel where he works, and thereafter his discovery of the body which of course brings the appearance of Inspector Maigret. I will add more of Eskin's analysis later in the month, since it contains "spoilers". This also a very interesting book in the sense that it throws light on Simenon's involvement in the German Occupation of France, since Les Caves du Majestic was one of the novels to be filmed at this time. Again, I will return to this in a later post. In David Carter's analysis, he puts Cecile est morte before Les Caves du Majestic in terms of composition, while an Italian website: MPC has Signe Picpus as an earlier composition. However, I think we can take it that Steve's meticulous bibliography is the one to follow! In Les Caves du Majestic, the narrative pacing, suspense and construction all work admirably, hand in hand with deft characterization and convincing scene setting. The scene is an extensive elaboration of one which Simenon had created more cursorily in the first Maigret, Pietr-le-Letton: the inner workings of the swank Majestic Hotel in Paris. As Maigret sniffs his way into the case, detective and reader alike experience total immersion in the disciplined hecticness of this labyrinthine infrastructure. Maigret observes the prime suspect ... Donge, who bicycles to work from his suburban cottage early every morning ... Reconstituting route, timing and behavior, Maigret, in a charming scene, gets himself a bicycle and pedals along behind Donge, comes to know his pathetic little household and his unhappy life history. The humble bicycling of the commissaire symbolizes well enough the sympathy of the mender of destinies for this ... little man. This novel shows Maigret at his most plebeian. He dislikes intensely the rich patrons of the Majestic, and all his sympathy is for the poor denizens of the basement of the hotel and the toilets of night-clubs. This is not purely sentimental: he shows clearly the amorality of two of the female characters (though he pities one enough to slip her some dope to ease her suffering). Even the minor characters in this novel are well drawn: the crooked banker turned carpet-dealer; the manager of the Majestic, forever concerned about scandal; the obnoxious owner of the correspondence bureau, all come to life. When you put the characterisations and plot in this novel next to those in an earlier novel like, say, Le Charretier de "La Providence," (my least favourite Maigret admittedly) it seems to me that this novel shows a real development in Simenon's talent and skill. Continental Films was set up with German money to run the French film industry, and was headed by a staunch Nazi, Alfred Greven, for whom Simenon had "amicably devoted feelings". In 1942 Simenon sold the exclusive rights to the Maigret character to Continental. When they announced that they were planning to make a film of Les Caves du Majestic, Simenon had to tell them that he had already sold the rights to an American company. Greven was not perturbed: he owned the rights so he would make the film. The scriptwriter was to be Charles Spaak. As he worked on the script he was arrested by the Gestapo and imprisoned on charges of Resistance activities  carried out not by him but his brother, whom they could not find. Spaak insisted on being given tobacco, food and stationery, and he finished the script in prison, with Continental sending someone to pick up the finished pages. The source of this information is Pierre Assouline (op. cit. p.207), whose research into Simenon's wartime experiences is impeccable and balanced. He seems to conclude that Simenon was not a collaborator (and finds some evidence to the contrary) but that he was both naive and opportunistic. Simenon's first revival of Maigret was a set of nine short stories written in October 1936, followed by a second set of ten produced in the winter of 1937-38. Each story in this second set was considerably longer than those of the first, with Maigret in five of them in his usual active position as a member of the Police Judiciaire based in Paris, but in the other five he is living in retirement and being asked to use his skills to solve a variety of mysteries. (Seventeen of these short stories were published in an English translation by Jean Stewart in book form under the title of Maigret’s Pipe, firstly in hardback by Hamish Hamilton, UK, 1977 and Harcourt, USA, 1978 and then in paperback by Penguin Books 4930, UK, 1984, and Harvest, USA, 1985  with the exception of Jeumont, 51 minutes’ stop! which is omitted from all American editions). Simenon wrote the Maigret novel Les Caves du Majestic at his home at Neuil-sur-Mer, near La Rochelle, in December 1939, making a gap of six years since writing his last Maigret novel, entitled Maigret, in November 1933. In this latter novel, Maigret had been retired from the police force for two years, but found himself engaged in proving his nephew innocent of supposedly shooting a nightclub owner. Gallimard first published Les Caves du Majestic in their weekly magazine "Marianne", in serial form, from April until October 1940 before issuing it in book form, with two more new Maigret novels, in the autumn of 1942, the volume containing the three novels being entitled "Maigret Revient" (Maigret Returns). Whatever the reasons Simenon had for returning to the Maigret novel, his text of Les Caves du Majestic has a fresher tone to it compared to the last two Maigret novels that he wrote for Fayard in 1933 which have a more sombre atmosphere perhaps as he was determined to finish with Maigret in order to concentrate on his other novels. With this new novel, Maigret is well and truly in situ, investigating a murder that has taken place in a luxury Paris hotel. Leaving aside all the short stories and articles, Simenon wrote 34 other novels in the six years between Maigret (1933) and Les Caves du Majestic (1939). Although these other novels vary in quality from interesting to outstanding, the author was obviously developing his skills with characterisation and structure, as well as maintaining his inborn sense of atmosphere. His experience with these other novels has obviously infected Les Caves du Majestic where there is about it a touch of relish as if he found the relaxation he needed after writing the sequence of his other novels. When he changed publishers to Presses de la Cité after the Second World War, he established a pattern of writing Maigret novels regularly between others until 1972 when he ceased writing novels altogether. Simenon chose a luxury hotel as the main setting for Les Caves du Majestic. 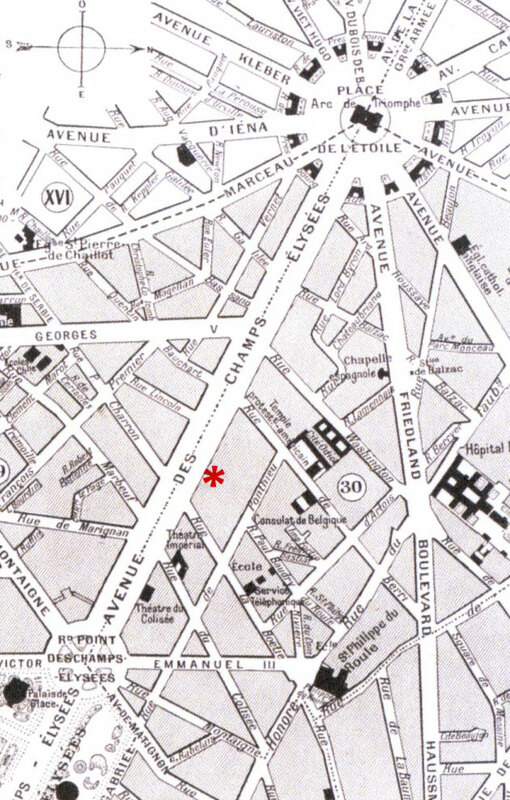 Although, at that time, there was a Hôtel Majestic at 19 Avenue Kléber (16th arrondissement), on one of the twelve avenues that radiate from the Arc de Triomphe, Simenon opted for the Hôtel Claridge at 74 Avenue des Champs Élysées (8th arrondissement), merely changing its name to Majestic. The site of the Hôtel Claridge is confirmed in the novel by the mention of the Rues de Berri and de Ponthieu. Simenon knew the 500 room Hôtel Claridge very well, staying there, as well as using it as a venue for meeting friends. (Note: In 1962 there was a fire in part of the hotel. Designated as an historic monument in recent years, the building has been divided up. Number 74 is now the address for two main establishments. On the ground floor is FNAC the home entertainments store, whilst the upper floors are Claridge, Champs Élysées, a three star, 81 room hotel. The name Claridge can still be seen just below the pediment at the top of the building. The site of the original Hôtel Majestic at 19 Avenue Kléber is now the Centre de Conférences Internationales). 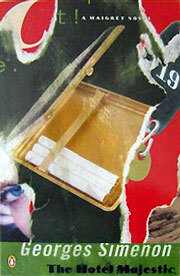 Two groups become involved as a result of the murder of young woman in the basement of the hotel. One group consists of a wealthy American businessman, his wife (the victim), the six or seven year old son, the governess and the nanny, who are staying at the hotel as guests. The other group is by former association, having been together some years before when they worked in Cannes on the French Riviera. 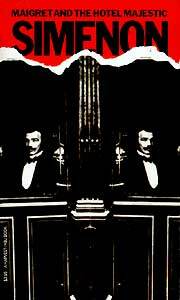 Maigret, at the hotel investigating, finds himself dealing with a variety of people  the guests who come and go as they please, and the various employees who are governed by, at times, a hectic routine of working in the basement kitchen area, which Simenon describes so well with his acute sense of place and atmosphere. Leaving certain details to be followed by his team, Maigret wanders about, with what he would describe as his lack of method, feeling his way around the layout of the hotel and its activities. Later, intuitively, he borrows a bicycle, so that he can accompany one of the main persons involved, Prosper Donge, to his home in the Parisian suburb of Saint-Cloud. In an earlier investigation (Le Charretier de la "Providence"  The Crime at Lock 14 / Maigret Meets a Milord), he cycles along a canal towpath in order to locate a barge that set off along that waterway some time before. Here Maigret cycles alongside Prosper Donge so that he can find out something about him, his home environment and meet up with Prosper’s companion Charlotte who works in the cloakroom of a Parisian nightclub. This leads Maigret to visit Cannes where he locates a third member of the second group. With the discovery of a second victim at the hotel and with the investigation building up as an intriguing and somewhat complex set of circumstances, Maigret, now back in Paris, finds himself having to focus on more than one factor  to discover the perpetrator of the murders and to try to settle the custody of the first victim’s young son. Maigret continues to talk to the same people as before, as well as receiving information from others, until he is certain that the whole investigation centres on forgery, blackmail and fraud. The English translation by Caroline Hillier, which follows Simenon’s French text closely, was first published only in 1977 by Hamish Hamiton in the UK and in 1978 by Harcourt Brace Jovanovitch in the USA, both in hardback format.